For, oh, the first 20 minutes of Robert Wise’s “Odds Against Tomorrow”, the film seems very much cut from genre granite. Three men who are down and out decided to turn to a bank robbery to score the funds that will make their lives properly bloom. We expect them to plan the robbery, to execute the robbery, and for the robbery to go awry. But then at roughly the 20 minute mark something happens – namely, one character calls another character a derogatory term. I will not type that term out loud and instead say the character subjected to the term is played by Harry Belafonte. Who is black. And did I mention this film was made in 1959? It is jarring, a kick in the ribs. 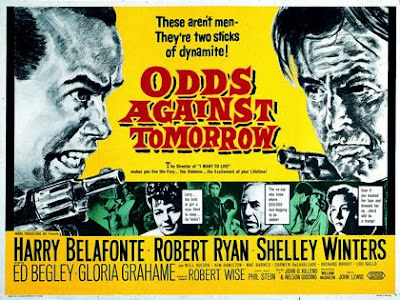 At that point, “Odds Against Tomorrow” boils over into something else, both a tough-minded character study and a harbinger of the racially radical 60’s. 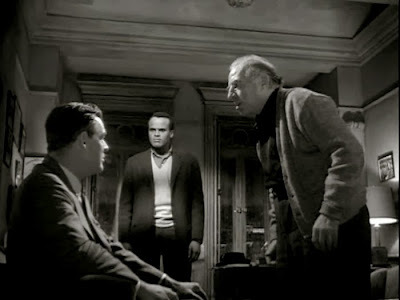 The bank job is the brain child of Burke (Ed Begley), a former cop, who wants a stack of cash to square him for life. Into his web he tries to pull Earl Slater (Robert Ryan), an ex-con, and Jonny Ingram (Belafonte), a nightclub singer and gambling addict. Initially each man stands Burke up. They may need money, too, but robbing banks is immoral. “That’s for junkies and joy boys,” Jonny declares. Little do you know, Jonny. Each man’s respective situation will eventually dictate, of course, his part in the plan, but the film is refreshingly patient in watching each man wind his way there. So often heist films are all about the heist, but “Odds Against Tomorrow” is as much about what leads to the heist as the heist itself. Backstories emerge. Jonny may be impeccably suave, but that in-control appearance belies an out-of-control addiction to the track. He loses more and so he gambles more and so he loses more and now he’s deep in debt to his bookie (Will Kuluva), a bookie who moseys around town with a flunky (Richard Bright) who is not so subtly gay, appearing to even sorta make eyes at Jonny the first time he sees him and/or issues a warning. This also goes to show how ahead of its time this film must have felt, particularly because his sexuality really isn’t even overplayed or explicitly addressed or meant as a key plot point…..it just is. Jonny has a daughter and wife…..well, make that ex-wife. She’s been driven away by Jonny’s money-wagering and she and daughter, of course, exist to be threatened by the bookie. But they are also there to offer further insight into Jonny’s worldview, and the fact his ex-wife is ingratiating his daughter into white society does not sit well with him. He is sophisticated but also seems convinced that racial lines should remain separate. Which is about all he and Earl have in common. That Earl’s violent racism is never explained feels accurate, because like Lady Gaga (and boy, wouldn’t Earl have just LOVED Lady Gaga?!) he was simply Born This Way. His reason for being re-led back into crime stems from his lady friend (Shelly Winters) for whom he wants to provide the requisite better life. Not that you should mistake him for an enlightened romantic. When his buxom (and married) next-door neighbor (Gloria Grahame) comes calling he does not hesitate. Yeah, there is anger in this film, these dudes are ticked off, and that volatility is what drives them to the heist. Based on a book, the screenplay was written by Nelson Gidding and Abraham Polonsky. Well, in 1959 no one knew Polonsky co-wrote it. He was famously blacklisted for refusing to testify before the House UnAmerican Activities Committee in 1951 and did not actually earn a proper writing credit for “Odds Against Tomorrow” until 1997. And it is not difficult to detect a seething Polonsky behind the scenes, aggressively taking out his understandable anger on the page, firing 12 Point Courier Font missiles at everyone. The heist goes wrong, but that goes without saying, and by that point the heist has actually become less important to the story then the men committing it. The cops arrive, only to fade into the background, ceding the stage to the tension between Jonny and Earl that has been threatening to erupt for ninety minutes into something so much more. They are so discontent with themselves and their fate that they turn on each other, though the showdown winds up less personal than allegorical. Racial inequality in America was a powder keg. The fuse was lit.